Superintendent of Police (SP) (Rural) Prabhat Kumar said six people were killed when a fire broke out at the house at Kumardubi village, about 85-km from here, under Ghatshila sub-division. 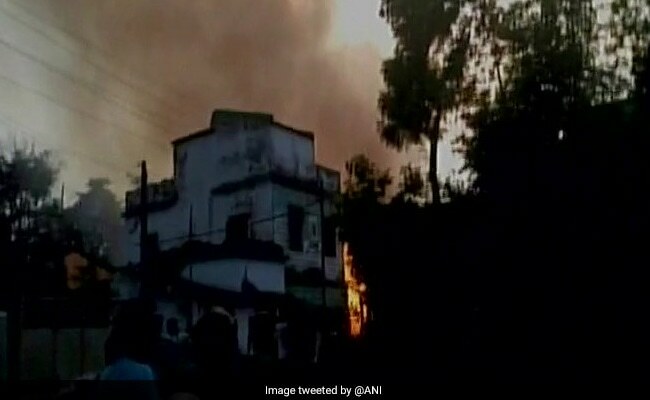 Jamshedpur: At least six people were killed and four others injured today when a fire broke out in a house where a large quantity of firecrackers were stored illegally in East Singhbhum district, a senior police officer said. A wall of the house collapsed in the fire and some people are feared trapped under it, Sub-Divisional Officer (SDO) (Ghatsila) Arvind Kumar Lal said. The SDO said at least four to five people are still trapped under the debris even as efforts are on to douse the flames. Intermittent bursting of firecrackers are still taking place, he said, adding that the injured have been admitted to a hospital. "A large quantity of firecrackers were stored as well as being manufactured illegally. Somehow, the stored firecrackers caught fire," Mr Lal said. The incident occurred when a large number of people gathered for the weekly market near the house. One of the victims was identified as Ms Parvati Shankra, who was the mother of the owner of the house, he said. Though the firecracker blasts are still taking place intermittently, the fire has been "limited", the SDO said. "Two fire engines are at the spot, and two others have been rushed from Jamshedpur and Ghatsila," said East Singhbhum district Deputy Commissioner Amit Kumar. Local BJP MP Bidyut Baran Mahato rushed to the spot on being informed about the incident. "I have already apprised Jharkhand Chief Minister Raghubar Das about the incident and urged the local administration to make adequate arrangements to provide the best medical aid to the injured in Jamshedpur," he said. Mr Mahato said that the Chief Minister assured him that an ex-gratia of Rs 2 lakh would be paid to the next of kin of the deceased while the injured will get Rs 50,000.